January 10th of 2012 I had a kidney stone attack which left me in the emergency room. The attending physician gave me a seven day dosage of Cipro (500mg twice a day)for an infection that I did not have, a preventative I have since been told. While in the emergency room the doctor and I joked about my low pulse rate(43 beats per minute)and about my being a biker and runner. When I ask the doctor when I could go back to running he said in a day or two once I was sure the stone had passed. For seven days I took the Cipro with no ill effects. I began running two days later and ran my usual five miles a day. On the day after I finished my medication I experienced pain radiating up my right calf near the end of my run. I thought I may have strained a muscle due to running on ice and snow. The next day, no pain except near the end of the run the same calf pain. The next day the pain on in my left calf. The odd thing was the pain was not like any injury I had ever had in 40 plus year of running. No soreness or pain in the morning or during the day, I would run about three miles and then the pain just comes on and then leaves just as fast. Then five days after my last dose I am running and three miles into my run severe pain in both achilles(I have not had achilles issues in over 30 years, I then knew something was seriously wrong. Over the course of the next four weeks the tendon pain got worse, it attacked my IT band, Achilles, ankles, arches, hip, and tendons that attach to the back and side of the knees. Also I would get burning and stinging sensations in my legs in those areas. The pains were random and could come and go as they pleased. The pain would also keep me up at night. The pain was throughout the day and night. Over the course of the last month the pain has subsided somewhat as it is not as severe nor lasts as long. But with that said I continue to get random pain and burning sensations. should be taking this Motrin but reluctantly trusting my sports med doctor of 25 years. Oh...that sounds like hell for an avid runner. 1. Theoretically the fluoroquinolone is out of the system after three days. One huge problem with Cipro, Levaquin, etc, is that it sets your body up for a huge chain reaction of negative factors. 2. Corticosteroids are not the best of ideas in a cipro toxicity situation. If for no other reason than they weaken connective tissue. 3. Anti-inflammatory drugs like Ibuprofen has their own downsides but are fine to help get your through the day as a painkiller. In no way are they any kind of 'fix' for Cipro poisoning. 4. Antibiotics as 'preventative' is, in my humble opinion, a HORRIBLE idea. Fluoroquinolone antibiotics as a preventative, should be criminal. 5. Tendonitis is simple. I can give you tips for Tendonitis. But Cipro tendonitis is NOT simple. It's very complex. With all due respect, your sports doctor has NO CLUE about what's going on or how to help you. How do I know that? Because of how he's treated you (as if you have regular injury). 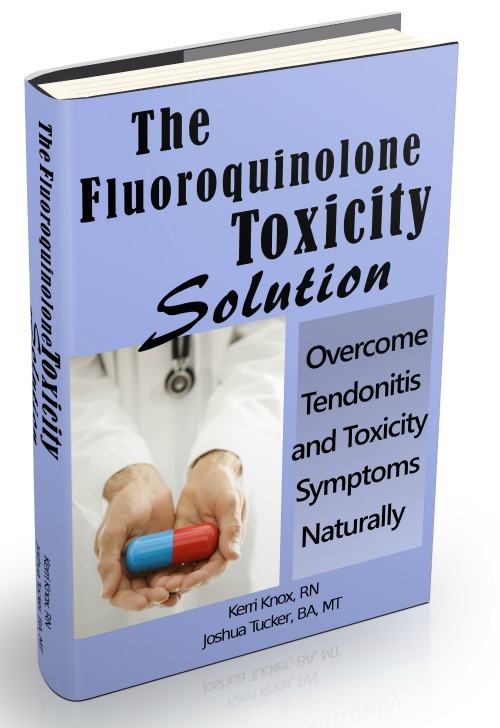 Get The Levaquin Tendonitis Solution ebook. It's your best and only (that I know of) option for countering the mechanisms the Cipro triggered and giving your body a chance to make things right. I can't stress this enough: Cipro tendonitis is NOT regular tendonitis. Rest, PT, Massage, etc, are not going to help. If you're lucky you're in the category of people that kind of naturally get better within a year. If you're not lucky, you're in the category of people that naturally DON'T get better, ever. The body literally can't heal unless you do the right things to help it. Took levaquin for pnuemonia I'm 58yrs old 50 mile per week runner first run after meds severe calf and achille pain at 1mile mark next try same results also foot pain constantly for no reason never had any pain even after long runs of 15 miles. Now have stopped running and try to get through day any solutions its been 2 months. How are you doing now, many months later? Either your pain has gotten better, or it hasn't. In either scenario, there's some things you'll want to do to help your body recover.